Steven and I are sharing the house here in Ahmedabad with two other artists; Elena and Carlotta from Switzerland. Elena is a photographer and Carlotta a jeweller. It has been fun to chat together at meal times, and the other evening Lokesh, the Indian artist who will come back to the UK with us, came over and we all took turns showing eachother our work. We also all went out to dinner at a place called Vishala last week; a large outdoor restaurant set up to feel like a village banquet. 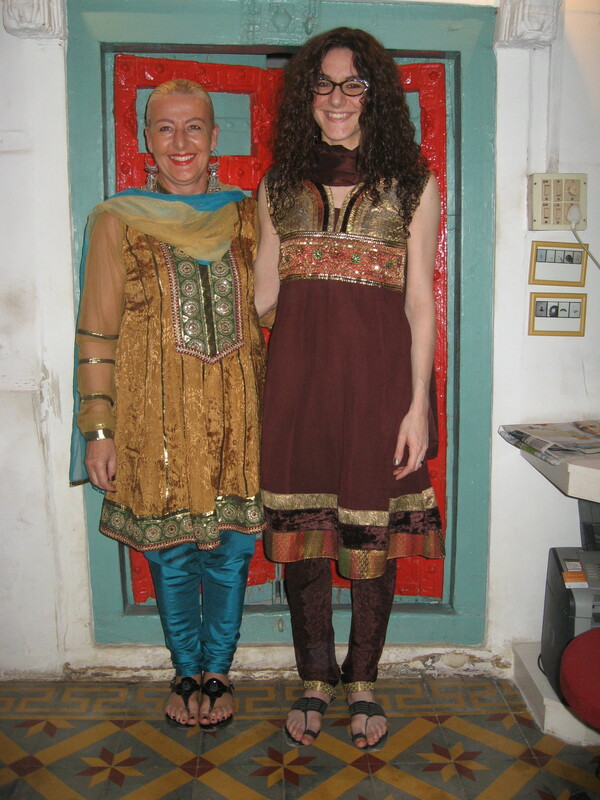 Elena and Lotti had just bought new Rajistani style dresses so we dressed up in true tourist fashion. The venue was surprisingly untouristy. 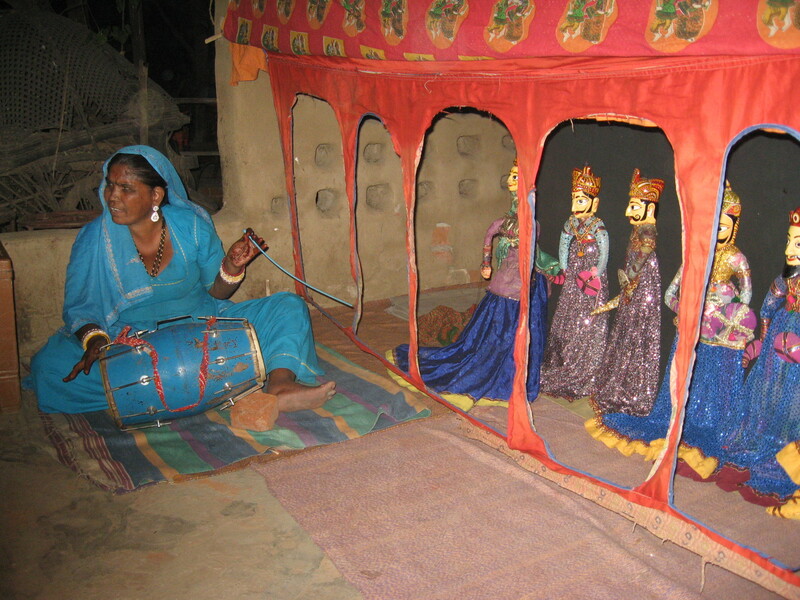 We watched a Rajistani puppet show with some of the children. I loved it; so colourful and fun. 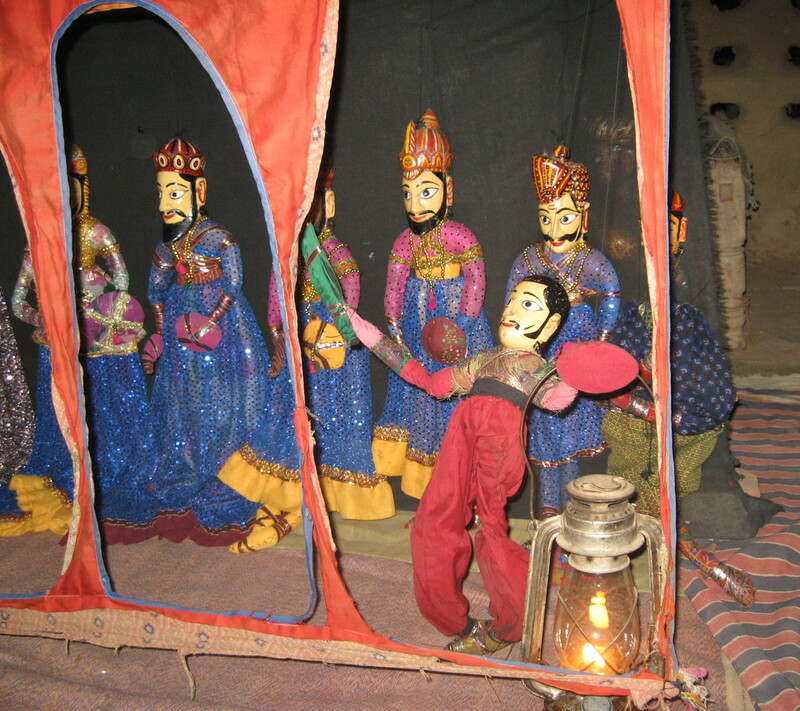 The puppets leapt off their stage at various points and into the audience, causing great delight. 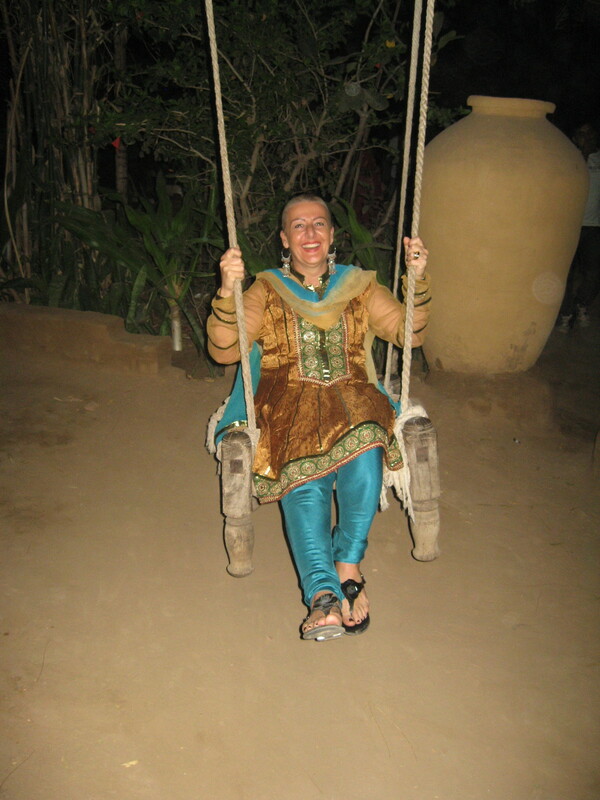 Oh and we played on the traditional Gujarati swings. You see them in many houses here and there are hooks for them in most of the rooms in Arts Reverie. they are big enough to fit two or more people on, and some sleep on them. There was a beautiful bed swing draped in textiles at the calico museum. 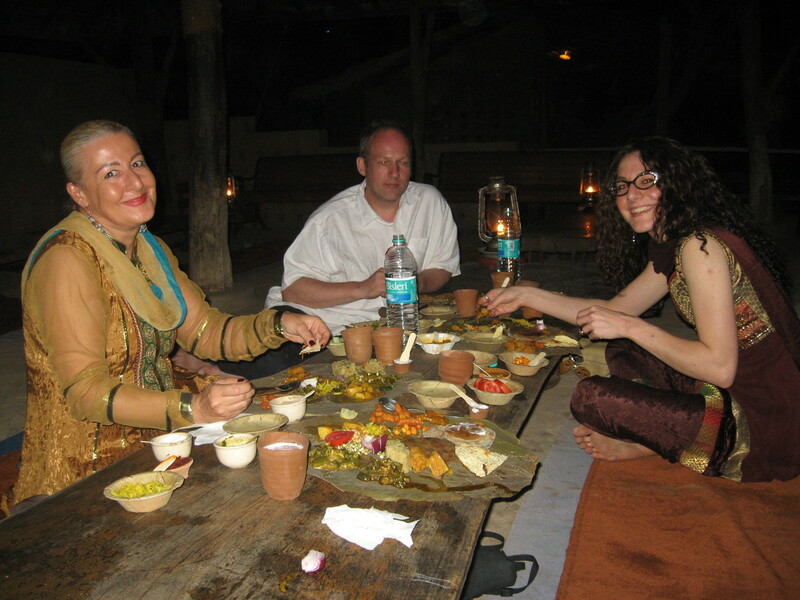 The meal was served by a team of super efficient turbaned ‘villagers’, on beautiful plates made of sewn leaves. It was traditional Thali style where small amounts of every dish are served on your plate, making a pattern (more patterns! ), accompanied by a buttermilk drink and lots of pickles and chapatis. Slowly getting used to sitting for long periods cross-legged after Bangladesh. Also eating with one hand and no knife or fork (or spoon). After dinner we danced to the ‘village musicians’, to the great delight of the locals who tried to teach us traditional dance steps. Lokesh also took us all one evening to see a beautiful Gaudi type building, known as the Gofi, in the grounds of the Architecture University campus. 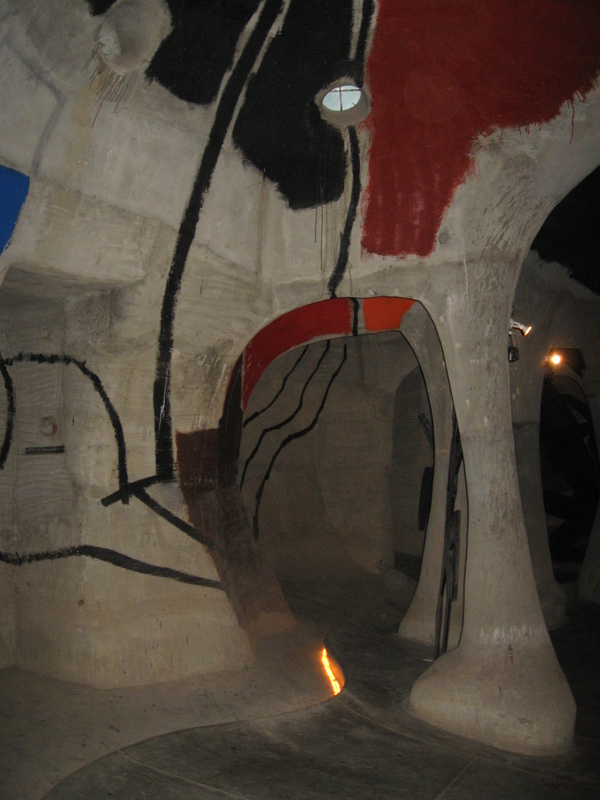 The building is cave like and very atmospheric. It used to be a library, but more recently contains a permanent exhibition of wall paintings. 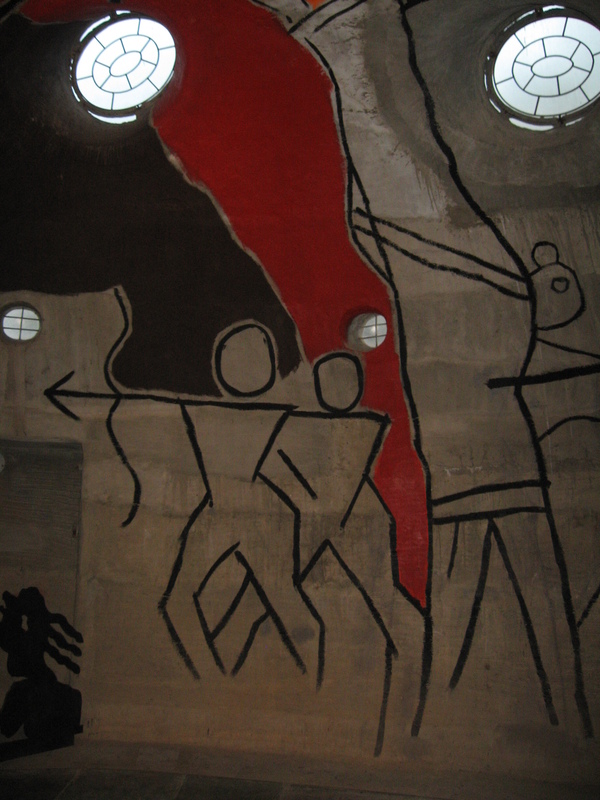 They reminded me of a Miro/Matisse/Lascaux combination. 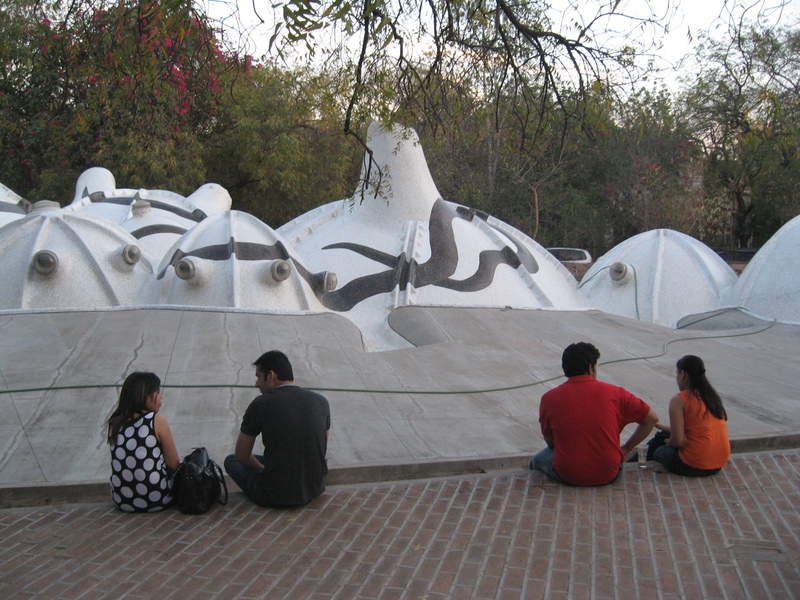 Only the roof of the building can be seen from the outside, strange dome shapes covered in white mosaic. There is a cafe by the Gofi where students sit out in the evenings. It was lovely to sit amongst them; though I could have killed for a cold beer (no alcohol in Gujarat or Bangladesh; very good for me! ).